Sony launched Firmware Update v2.20 for the Playstation 3 Monday night, officially upgrading the game console to a BD-Live (aka Profile 2.0) Blu-ray player. As we've previously reported, this latest PS3 update was announced by Sony last week, and earns the PS3 the distinction of being the first Blu-ray player in North America to include BD-Live, enabling users to experience interactive features via specially-encoded Blu-ray discs, including downloadable video content, ringtones, live "interactive movie-based" multi-player online gaming and more. 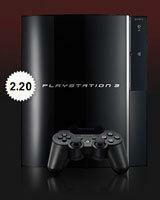 Sony's press release for the PlayStation 3 Firmware Upgrade Version 2.20 can be read in full here.